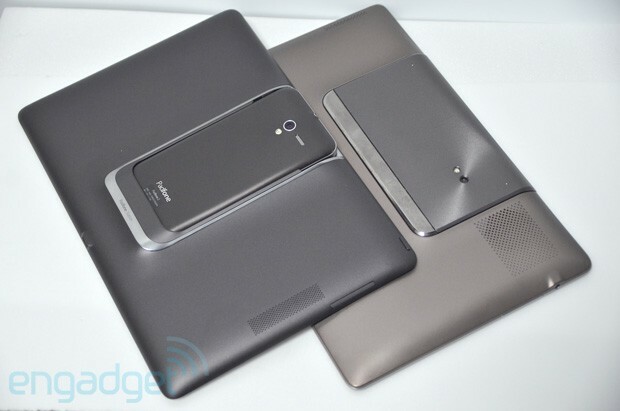 Engadget: ASUS PadFone 2 vs PadFone 1... hang out! ASUS PadFone 2 vs PadFone 1... hang out! While getting their hands dirty with the ASUS PadFone 2, our guys over at Engadget Chinese also had the chance to compare it with the OG PadFone, and they came back with a generous batch of side-by-side shots. Here you can see how the phone itself is almost just a scaled-up copy of its predecessor, while the new PadFone Station slate loses some body fat by shedding the original docking bay cover, and we're certain that the battery has become denser and lighter as well to achieve this amazing diet -- we're talking about losing just over 200g here! Also apparent is the new 13-pin dock connector at the bottom of both the phone and the tablet. For the rest, we shall let your eyes do the work in the gallery below. Enjoy! ASUS PadFone 2 vs PadFone 1... hang out! originally appeared on Engadget on Tue, 16 Oct 2012 03:09:00 EDT. Please see our terms for use of feeds.